HOUSTON — NASA's identical twin astronauts, Mark and Scott Kelly, are drawing a line between their professional and private lives in the face of intense media interest in Mark's wounded wife, congresswoman Gabrielle Giffords. This week the astronaut brothers canceled scheduled interviews with reporters to preserve a measure of privacy about the family crisis. Giffords, D-Ariz., is recovering after being shot in January outside a Tucson grocery store during a constituent meeting. Mark Kelly decided last month to continue training as the commander of the space shuttle Endeavour on its final mission, set to launch April 19. Kelly and NASA yesterday decided to cancel a series of one-on-one interviews with reporters scheduled for today (March 24). The interviews with reporters are traditionally arranged for every shuttle crew member to discuss an upcoming mission. Kelly said he asked to cancel the interviews because they probably would have strayed from the topic of the historic last flight of shuttle Endeavour. "I anticipated that I would likely get a lot of questions about her, which I wanted to address just in a statement," Kelly told reporters today in a press conference here at NASA's Johnson Space Center. "I'd like you to respect the fact that this is about STS-134 and it's not about my wife's recovery," Kelly said. "I'll be happy to talk about that, but that's at a later time and we can coordinate that through Gabrielle's office." The astronaut did provide a brief update on his wife's condition before steering the session on to the spaceflight at hand. "She's doing remarkably well. She's improving every day," Kelly said. "She's starting to walk, talk more every day. I see her every morning before I go to work and when I come home from work at the end of my day." Giffords was shot in the head Jan. 8 by a man who opened fire during her meeting with constituents at a Tucson grocery store. Six people were killed and 13, including Giffords, were wounded. A 22-year-old Tucson resident, identified as the gunman by federal prosecutors, is being held on various charges. Kelly's plea for privacy came two days after his twin, Scott Kelly, canceled interviews that were meant to shine a spotlight on his own recent stint as commander of the International Space Station's Expedition 26 mission. In Scott's case, the media representatives were told not to ask about Giffords but apparently didn't listen. After completing three interviews, Scott called off the rest. "Every one of the interviews did open up with a question or two related to his sister-in-law's condition," NASA spokesman James Hartsfield told SPACE.com. "Scott did patiently outline to them that he wasn't going to answer those questions … However, every one of the three interviews he was conducting did start out that way, and he had to repeat himself, and after three he informed us that he did not want to proceed with them." That episode served as a caution for NASA and Scott Kelly's brother. "Mark Kelly has expressed concern, based on his past media experience and the recent experience with his brother Scott conducting interviews, about his ability to have media attention focus on his mission in the interviews rather than his personal family matters," Hartsfield said. 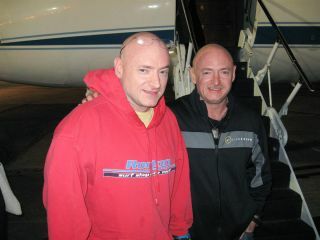 The Kelly brothers are the world's only set of astronaut identical twins, a fact that already gave their respective missions an extra boost of publicity. At one point, Scott and Mark were expected to meet up in space when their missions overlapped. However, delays to another shuttle mission – this month's final flight of shuttle Discovery – pushed back Mark's flight until after Scott's return to Earth, which occurred March 16. The attack on Giffords and her subsequent recovery efforts have thrust both astronauts into an even brighter spotlight. While in space, Scott Kelly fielded repeated questions from reporters on Earth about how he was handling the news about his sister-in-law while he was in space. After landing, a NASA photograph showed him wearing a wristband in honor of Giffords. Mark Kelly participated in several press events to provide updates on his wife's condition, first at the hospital treating her and later during a NASA press conference in February when he announced his decision to stay on as commander for Endeavour's final mission. Mark also posted messages on Facebook and on Giffords' website thanking the public for the outpouring of support for his wife and the other victims of the Tucson shooting spree. Yesterday Mark Kelly addressed reporters while accompanied by the five crewmates who will accompany him on Endeavour's final voyage. The astronauts will haul supplies and an astrophysics experiment to the International Space Station. Their two-week journey will be the last flight for Endeavour, which is being retired this year along with the rest of the NASA shuttle fleet. NASA plans to fly one more mission after Endeavour's, then close its 30-year-old space shuttle program. The shuttle Atlantis is due to deliver more supplies to the International Space Station. That final mission, STS-135, is slated to launch in June.